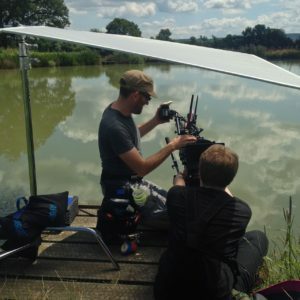 In June I was recommended by a mutual friend to shoot a short drama called Perplexed Music, inspired by the Elizabeth Barrett Browning sonnet of the same name. It’s a passion project from writer-director Mark McGann, with his brother Paul McGann (Doctor Who, Alien 3, Withnail & I) in the lead role of a man grieving for his deceased partner. 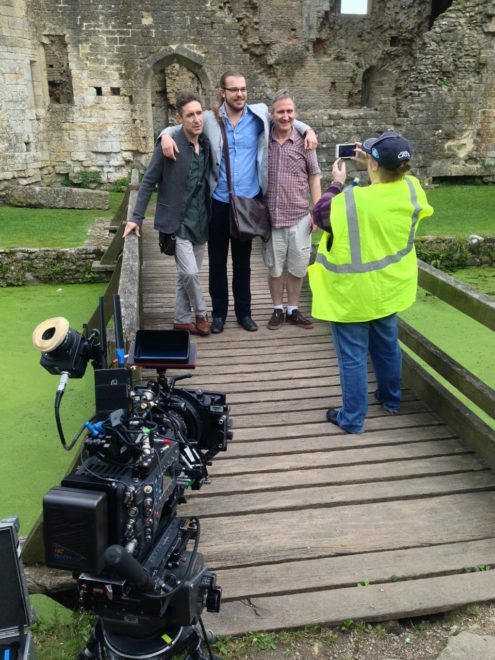 Paul and Mark pose with one of the supporting artists between takes. 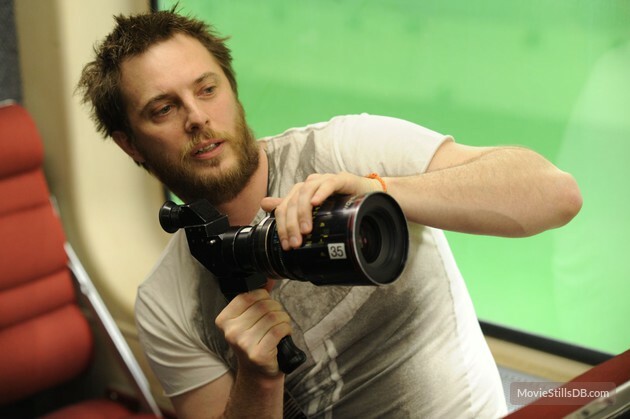 Mark was keen from the outset to shoot on an Alexa, and I was quick to agree. 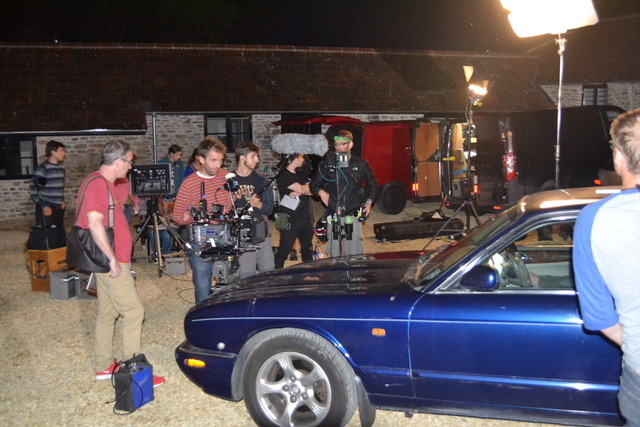 Arri Rental very kindly gave us an amazing deal on an Alexa Classic and a set of Ultra Primes. As on Above the Clouds, we used a Blackmagic Micro Cinema Camera as a B-cam, capturing two specific angles that were impossible on the Alexa with our limited grip budget. Throughout July, Mark and I had a very satisfying creative dialogue about the cinematic techniques we would use to tell the story of Paul’s character, The Man, who never speaks. I had been watching a lot of Mr. Robot, and was keen to use unusual compositions as that show does. The visual grammar that we ultimately developed eschewed The Rule of Thirds, either squeezing The Man right into the side of frame – at times when things are too much for him – or placing him dead centre for moments of clarity and acceptance, and for flashbacks to when his partner was alive. 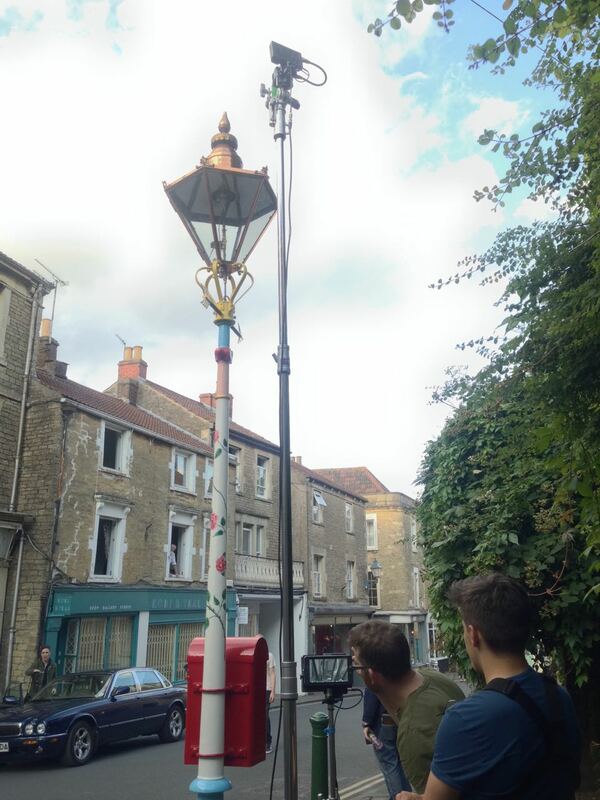 The Blackmagic Micro Cinema Camera is mounted on a combo lighting stand to capture a high angle through a streetlamp. While testing lenses at Arri Rental a few weeks prior to the shoot, I took the opportunity to shoot some frame-rate tests between 24 and 48fps. Since the film has so little dialogue, I figured there was nothing to stop us using a lot of slow motion if we wanted to. I didn’t want it to look like a music video though. I thought perhaps a very subtle over-cranking, creating languid blinks and slightly heavier movement, would add to the burden of The Man’s grief. Mark agreed as soon as he saw the tests, and we ended up shooting a number of set-ups at 28 and 30fps, plus 40fps for a pivotal sequence. 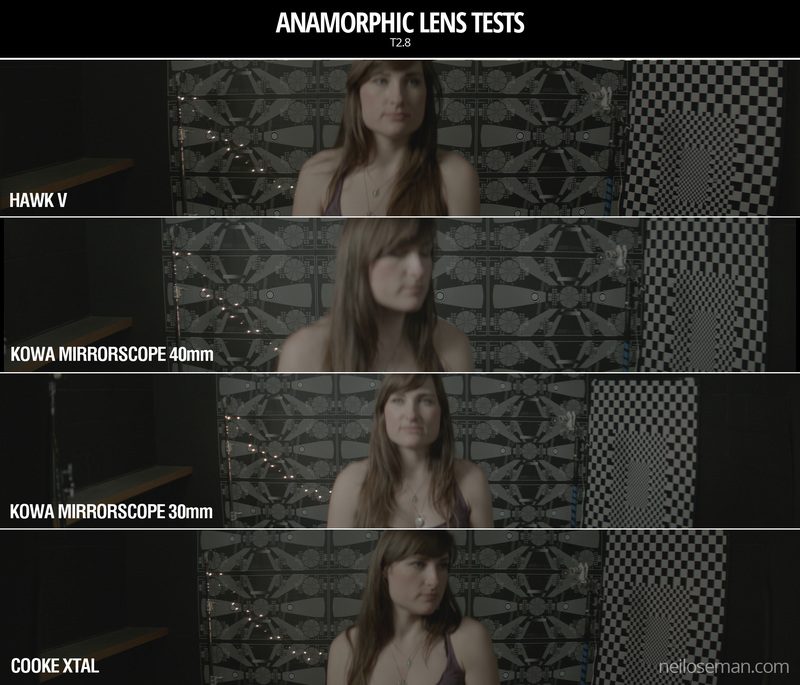 I also tested various ISO settings on the Alexa (click here for full details, stills and video from this test). Based on these, I decided to use ISO 1600 for the majority of the film, partly for the extra latitude in the highlights, and partly to add grittiness to The Man’s grief-stricken world, in the form of a little picture noise. When we started shooting the flashbacks, on the spur of the moment I decided to switch to ISO 400 for these. A few years back I shot the music video below on a Red Epic and, for reasons I forget, one set-up was done at a lower ISO than the rest. I remember the feeling this gave, when I saw the final edit, of everything suddenly being smooth and hyper-real. 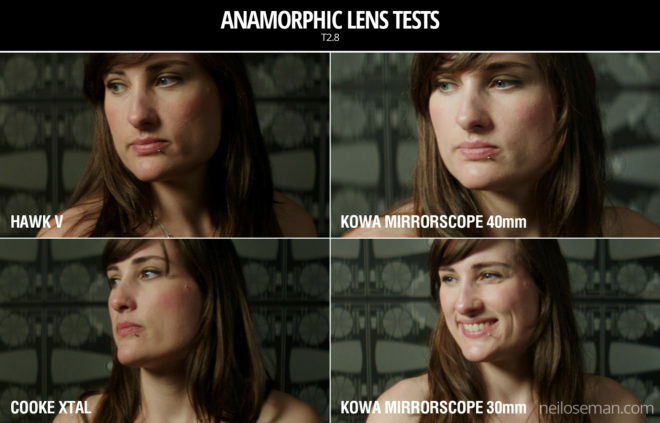 (You can just about it discern it through the Vimeo compression at 1:48.) I thought that would be a great feeling to give to the flashbacks. 1st AC Rupert Peddle and 2nd AC Ben Davies set up a lakeside close-up under a diffusion frame which will soften the light on Paul. 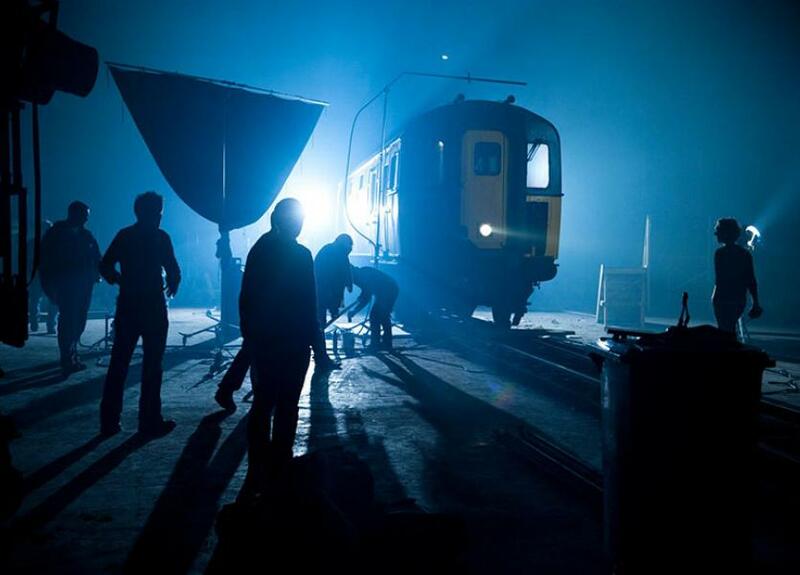 Much of Perplexed Music was day exterior, but a couple of sequences required lighting. In the opening café scene, I fired HMIs through two windows, but kept their light away from The Man, keying him with a practical to put him in his own little world. Meanwhile, a happy couple he’s watching are bathed in sunlight (sometimes real, sometimes not) warmed up with a quarter CTO, and bouncing beautifully off their table to give them a healthy glow. For night interiors at The Man’s home, I was keen to rely on practicals as much as possible. Firstly there wasn’t much space in the little cottage, secondly I didn’t want the hassle of having to shift them around to keep them out of frame when we changed angle, and thirdly it just looks more natural. So aside from a tungsten bounce in a corner of the living room we knew would never be seen, I stuck to practical table lamps and exterior lighting. I had planned to use direct HMI sources for moonlight through the windows, but my gaffer Sam suggested going softer so that we wouldn’t have hard shadows inside which would need filling. I saw that he was right, so we used a kino through one window and a 2.5K HMI bounced into poly through another (pictured at left). 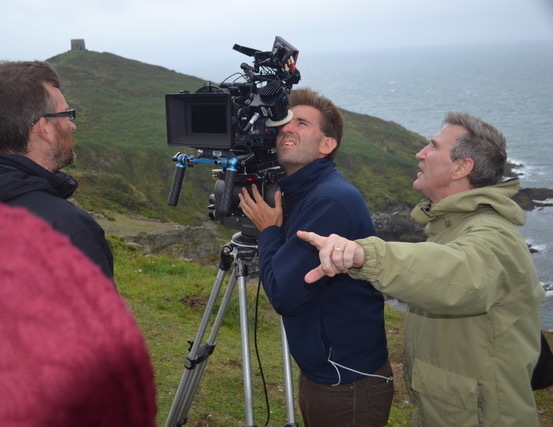 Perplexed Music was shot over five days in Frome in Somerset and Rame in Cornwall. The latter provided us with a spectacular cliff-top and the isolated St. Michael’s Chapel on the peak of the headland. Here we employed the services of The Fly Company, who captured two dramatic, sweeping shots on their DJI Inspire 2 drone. We were all extremely impressed by what they were able to achieve, especially as it was done in very windy conditions, in between rain showers. We completed the final set-ups of the schedule as the winds began gusting up to 60mph, and poor Paul could barely stand upright! I was certainly glad we picked the Alexa to shoot on, because anything lighter would probably have shaken during takes, if not blown over! I had a fantastic time working with Mark and Paul, and the whole cast and crew. We were sad to part ways at the end of the week, and we all look forward to seeing the finished film soon. And at this point, dear reader, I ask for your help. Currently a Kickstarter campaign is underway for postproduction. It’s well over 50% funded at the time of writing, but every little helps in our quest to reach the finishing line. Rewards for backers include thank you video messages from Paul and Mark, and tickets to a private screening in December. Even if you can’t contribute, please consider sharing the page on social media. Thanks! Some have hailed it as a masterpiece, others have complained it left them cold. Personally, seeing it on 70mm, I found Dunkirk a highly immersive and visceral film, cinematic in the truest sense of the word. The huge, sharp images free from any (apparent) CGI tampering, combined with the nerve-jangling gunshots and rumbling engines of the superlative soundtrack, gave me an experience unlike any other I can recall in recent movie-going history. I can imagine that it was less effective projected from a DCP onto a smaller screen, which may account for the underwhelmed reactions of some. But however you feel about Dunkirk as a film, it’s hard not to admire its technical accomplishments. 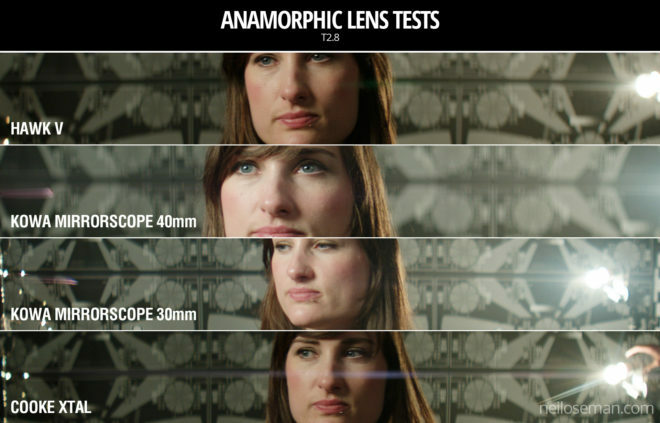 Here are five unique aspects of its cinematography. 1. It was shot on two huge formats. Imax is a process which uses 65mm film (printed on 70mm for exhibition, with the extra space used for the soundtrack) running horizontally through the gate, yielding an image over eight times larger than Academy 35mm. Following some test shots in The Prestige, Nolan captured whole sequences from The Dark Knight, The Dark Knight Rises and Interstellar in Imax. 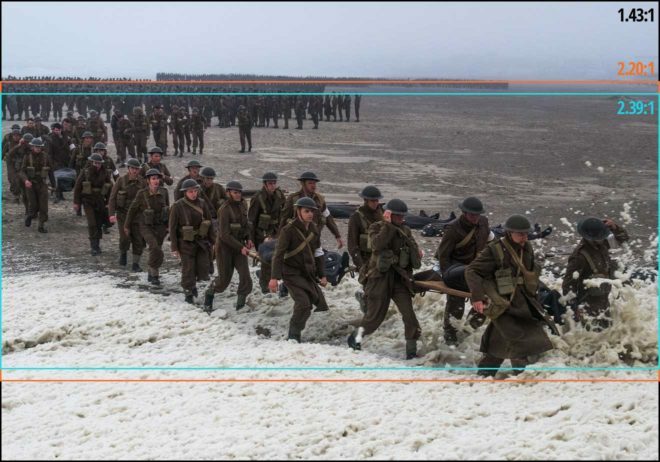 For Dunkirk, Nolan and cinematographer Hoyte van Hoytema, ASC, FSF, NSC were determined to eliminate 35mm altogether, to maintain the highest possible resolution throughout the movie. 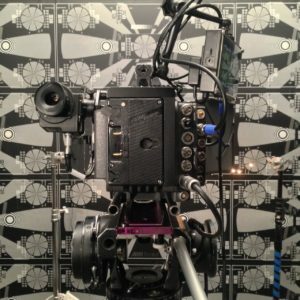 Imax cameras are noisy, so they shot dialogue scenes on standard 65mm – running vertically through the gate – but Imax footage makes up over 70% of the finished film. 2. 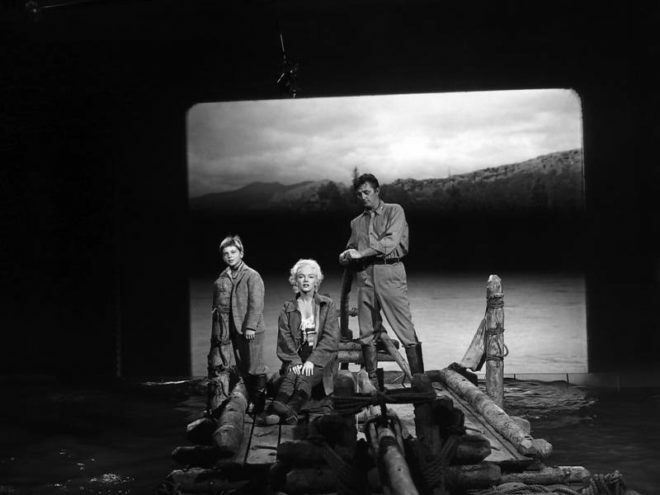 The movie was framed with three different aspect ratios in mind. Those who watched Dunkirk in an Imax cinema got to see the native aspect ratio each sequence was captured in, i.e. 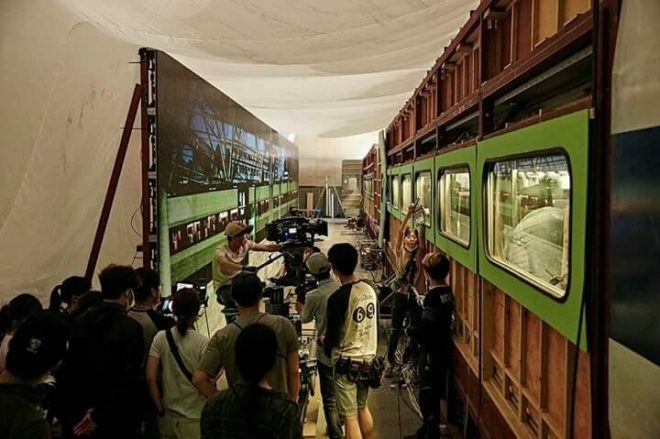 2:20:1 for the standard 65mm dialogue scenes but the much taller 1.43:1 for the Imax material, the bulk of the film. Those, like me, who attended a standard 70mm screening, saw it in 2:20:1 throughout. And those hapless individuals who watched it digitally apparently saw the standard Scope ratio of 2.39:1, at least in some cases. 3. Parts of the camera rig were worn as a backpack. Breaking with the accepted norms of large format cinematography, van Hoytema captured a significant proportion of the movie handheld. The 65mm camera package weighed over 40kg – about three times the weight of a typical Alexa rig – with the Imax camera only a little lighter. To avoid adding the weight of the batteries, video transmitter, Cinetape display and Preston (wireless follow focus) brain, these were placed in a special tethered backpack which was either worn by key grip Ryan Monro or, for water tank work, floated on a small raft. 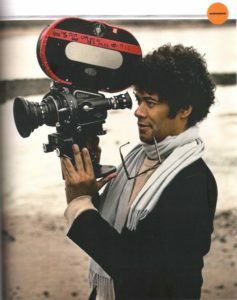 Unfortunately, Hall quickly found that electromagnetic interference from the Imax camera rendered the Cinetape inoperable, so he ended up relying on his extensive experience to keep the images sharp. “I had to go back to the technology of the 1980s, where I basically guess how far famous people are from me,” he remarks drily in this enlightening podcast from Studio Daily. 4. 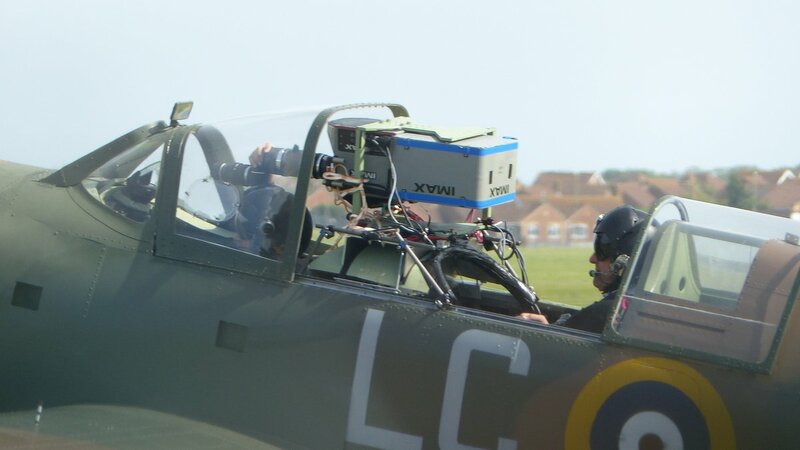 A periscope lens was used to shoot spitfire cockpit interiors. 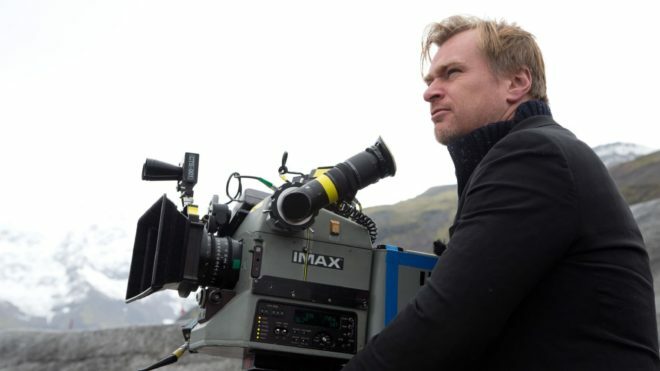 “I wanted to tell an intensively subjective version of this story,” says Nolan. To that end he requested over-the-shoulder views out of the windscreens of Spitfires in flight. Furthermore, he wanted to be able to pan and tilt to follow other aircraft passing by. Given the huge size of the Imax camera, there was no room to rotate it within the cockpit. Instead, custom periscope lenses were built which could snake over the pilot’s shoulder, and pan and tilt independently of the camera body, using prisms to maintain the correct image orientation to the film plane. Other glass used on Dunkirk included an 80mm Imax lens belonging to Nolan himself, and converted stills lenses. Note that the camera is mounted upside-down, to compensate for the flipped image generated by the prism in the periscope lens. 5. At one point the camera sunk to the bottom of the sea for an hour and a half. 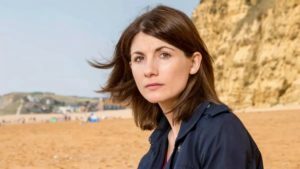 Reaction to Jodie Whittaker’s casting as the new Doctor pretty much broke the internet last month. While the majority appear to be in favour, a significant minority reacted with hostility. At first glance, the haters did seem to have a reasonable point. The Doctor is a man, has always been a man, so it’s weird to regenerate them into a woman. After all, there are constants across every regeneration, different as it may be to its predecessors. For example, the Doctor always has a British accent. If the Doctor ever gained an American twang, there would be outrage; the Doctors’ Britishness is a fixed point of their ever-changing character. 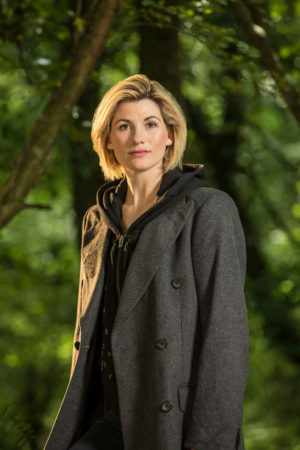 Is it so unreasonable for their gender to be another fixed point, something to anchor their character and reassure viewers that despite the new actor, this is still the Doctor you know and love? But as soon as you start to think about it, this argument collapses completely. After all, Doctor Who‘s 54-year history is littered with contradictions and continuity errors. The majority of the episodes produced under Steven Moffatt were full of plot-holes, so to suggest that there is anything fixed, immutable and logical about the show is utterly ridiculous. It’s pure fantasy. Fantasy – that’s a key word that I’ll return to later. People said that in 1966 when the Doctor first regenerated. They said it when he was exiled to Earth in the 70s. They said it when it got campy in the 80s. They said it when the American TV movie was made in 1996. They said it when Russell T. Davies resurrected the show in 2005. They said it when Tennant left in 2010. And now they’re saying it again. Change, evolution, moving with the times – these are the reasons that Doctor Who is the longest-running sci-fi show on the planet. The world has changed enormously since William Hartnell first flickered onto the screen with his magic blue (grey) box. It’s the show’s ability to develop in step with the real world that makes it a continued success. These changes are visible in the ever-improving VFX, the topical themes of the stories, the shifts in tone under new showrunners, and crucially through Who‘s groundbreaking concept of regeneration. I saw a post from a man who was angry and upset to lose what he saw as a crucial role model in his life. His argument was that male heroes are usually more physical and violent, whereas the Doctor’s more intelligent approach made him great for encouraging men into STEM (Science, Technology, Engineering, Maths) careers. Peter Davison, the fifth Doctor, expressed a similar concern. But it is women who are under-represented in STEM industries, not men. And if you’re looking for other intelligent male role models, how about super-brainy Sherlock? Or engineering genius Tony “Iron Man” Stark? Or most of the Star Trek captains and science officers? Even if you reject every other film and TV show’s male heroes as not intellectual enough, you still have the other twelve Doctors. Can’t we let 50% of the population have one female Doctor in there to look up to? It’s no secret that Doctor Who‘s ratings have been steadily declining in recent years, so some people have come to the conclusion that incoming showrunner Chris Chibnall cast a woman purely to generate controversy and draw attention to the show. Undoubtedly Chibnall would have seen the press and social media interest as a bonus to casting a woman, but it can’t have been the sole or primary motivator. Chibnall is first and foremost a writer, and no writer would ever cast a lead actor to bring their character to life if they didn’t believe absolutely that that actor was right for the part. The first woman in the role is bound to attract a greater degree of scrutiny and criticism than another man when her episodes start screening, so if the show is to have a hope of impressing the critics then the Doctor has to be an excellent actor with an impeccable track record. And Whittaker is definitely that. This move is far from cynical. It’s bold, refreshing and relevant, and for this fan at least it gives me more excitement about the next season than I have felt for some time. Political correctness has become a dirty phrase, but all it really means is being careful not to offend oppressed or minority groups unnecessarily. So to say that Whittaker’s casting is political correctness gone mad is to suggest that it’s placating people who have no valid complaint of oppression or under-representation. Let me say it again: twelve of the thirteen Doctors are men. (Thirteen of fourteen if you count the War Doctor.) Only one is a woman. That’s less than 10%, compared with 50% of the population being female. That is the very definition of under-representation. And let’s not forget that Whittaker’s casting was announced after the men’s Wimbledon final, not the women’s, because we still live in a world where women, and all the things women do, are considered less important than their male counterparts. 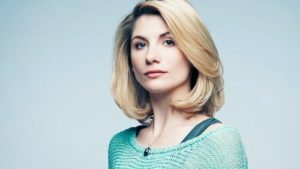 Casting a female Doctor is not “political correctness gone mad”. It’s taking a small step towards correcting a huge imbalance. I suspect the men who wrote comments like this did not stop to consider the more limited choices their mothers, daughters and sisters have in this matter. If women threw their toys out of the pram every time a TV show or film came along with a male lead, they wouldn’t get much else done. Women have got used to watching stories led by the other gender; we men must learn to do the same. To the people who still say, “but the Doctor is a man,” and suggest that casting female leads in new shows would be better than swapping the gender of an established character, you may be right. And when 50% of all big franchises have female leads there will be no need to do this kind of thing, but until then, it’s necessary. Until then, us men whining that we’ve lost something in this situation is like a millionaire crying because they dropped a penny down the drain. Finally, let’s return to that keyword, fantasy. Because I think the most significant things about Whittaker’s casting are the kids in the playgrounds who will grow up with choice. The girls won’t always have to play the kidnapped princesses, or the love interests, or the companions, while the boys get the roles with agency; they can play Rey, or Wonder Woman, or the Doctor. That can only be beneficial to the future of our society.